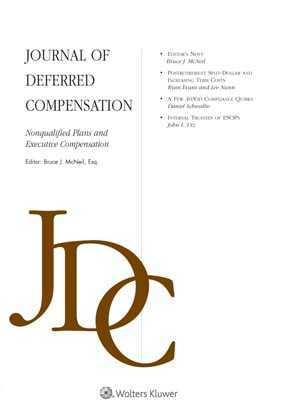 Journal of Deferred Compensation: Nonqualified Plans and Executive Compensation is a unique source of timely analysis, innovative strategies and practical solutions for professionals in the field of executive compensation. This quarterly journal helps you navigate through the new government rules that limit the salary and benefits of top employees and expose employers to additional tax liabilities. Every facet of this fast-growing, fast-changing field is covered in this publication, from the fine points of elective deferral plans to the exposure of deferred compensation funding to corporate creditors. If you are responsible for the design, administration, or funding of executive compensation, and if you want to attract key executives while controlling corporate tax liability, this is essential reading.